Made of durable yet lightweight 100% machined aluminum - built to last for a lifetime of riding. 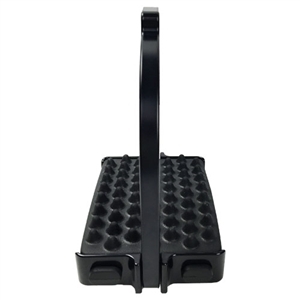 They are extremely resilient and feature an extra-wide & deep design allowing your feet the room they need to properly distribute weight while riding. E-Z Ride Stirrups have long been the #1 long distance stirrup and can be used with any Endurance, English, Dressage or Western saddle. EasyCare's completely redesigned the top bar system, which allows stirrup leather widths ranging from 1"- 3" to be used. No more top bar switching! 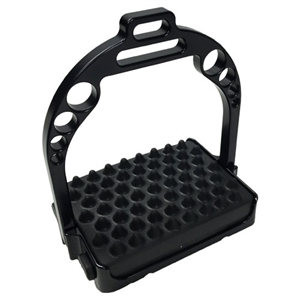 Also new to the design is a compression resistant closed-cell EVA foam foot pad with four "plugs" that clip into the 100% machined aluminum base frame of the stirrup, which are easily replaceable once existing pads wear thin. The 100% aluminum material provides a significant, virtually indestructible foot base that will last a lifetime - the last pair of stirrup you will buy! Have an existing foot, knee, or lower back problems? These E-Z Ride Stirrups are great for those riders or for those who wish to take a preventive step. Sold as a pair. Extra-Large, EVA-Foam, Shock-Absorbing Footbed with Male Plugs - No Gluing Required! 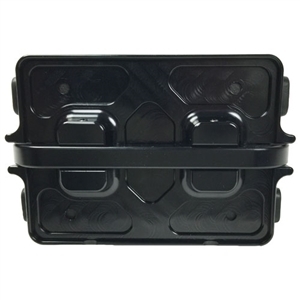 #1 Top Bar Width: 1"
#2 Top Bar Width: 3"
Footbed Width: 5" - 5.5"